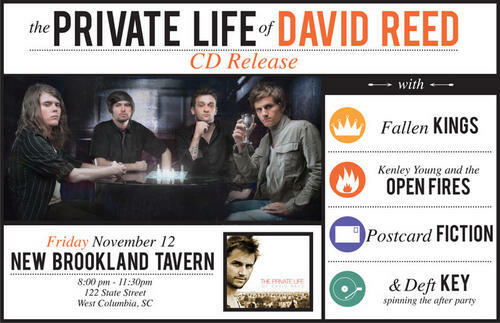 There has been much hype surrounding the release of David Reed’s new album and today you can make it yours. Over the course of the year The Life of David Reed has been featured locally on WRXY unsigned, 107.5 The Game and nationally on such websites as The Sound Alarm, AbsolutePunk, Crushable and Ragged Mag. Just last week he wrapped up a tour that took him all across the country and now he is back home to celebrate the long awaited release of his new album with close friends. For the show this Friday, TPLoDR is bringing along his friends in Fallen Kings, Postcard Fiction and Kenley Young and the Open Fires. The new material from TPLoDR is more aggressive, edgier and flows with purpose. Songs that translate to an in your face live show. Download a song here for free if you haven’t already. Back in October, we had the opportunity to host David Reed solo at our house. Check out the performance below.